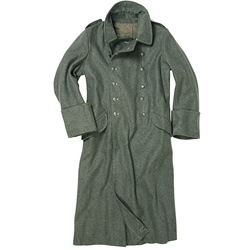 Reproduction of the war model German M40 Wool Greatcoat. These overcoats were worn throughout WWII by both the German army (Heer) and SS units. The wool fabric and twill lining are excellent quality; greatcoat has roll back cuffs, hook and eye fastener at the collar, hand sewn skirt placket and accurate raw edge hem. These well made versions of the M40 Greatcoat capture all the details of original WWII greatcoats. Piping colors vary, sorry no choice. Marked in metric sizes, order your regular coat size.